Under the broad umbrella of “cultural responsive science”, the Racial and Cultural Inclusion and Social Change Lab focuses on advancing the study of race and culture in psychology. We are interested in the experience of marginalized populations (e.g., racial minorities, women, immigrants) and how to improve systems, practice, and research that are culturally relevant to their lived experiences and worldviews. Our studies pay particular attention to socio-cultural identities (e.g., gender, ethnicity, race, social class) and to race and culture as psychological and subconscious processes of human thought and behavior. 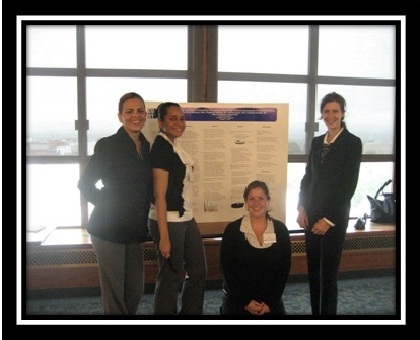 Professor Mazzula’s Racial and Cultural Inclusion and Social Change Lab at John Jay College was established September 2009 when she joined the Psychology Department faculty. Since then, Dr. Mazzula has directly mentored more than 40 students interested in research, an in cultural competencies specifically. Her student research assistants, undergraduate and masters-level students, have presented at local and national meetings throughout the country, and many have gone on to pursue their doctorates. Formerly known as the Racial and Cultural Psychology Research Laboratory, the lab’s name was changed in 2018 to reflect the Dr. Mazzula’s work on the role of psychology and race-relevant studies in improving all areas of society, particularly the workplace, systems of education and community-based initiatives to improve the lives of marginalized populations across the United States. 1) Bicultural efficacy and mental health, particularly among Latinx, African American, and Asian American populations. 2) Race-based cultural experiences, racial trauma, and racial-cultural stress. 3) Racial and cultural competencies in research, practice, and scholarship. 4) Doctoral Pipeline and workplace equity and inclusion. Research assistants typically commit 10-15 hours per week, for at least two consecutive semesters (e.g., fall and spring). These are not paid research assistant positions. Contact Dr. Mazzula directly at smazzula@jjay.cuny.edu or the lab administrators at slm.lab.2408@gmail.com. You can also schedule a time to meet with her during her office hours. General questions about the benefits of obtaining research experience? Read John Jay’s Forensic Psychology Graduate Student Research Group Frequently Asked Questions. 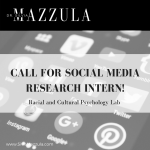 If you would like to be considered for general research assistantship openings, please email Dr. Mazzula a copy of your resume/CV and a cover letter that includes 1) your specific interest in the lab, 2) prior research experience, 3) contact information for one faculty or research advisor reference. 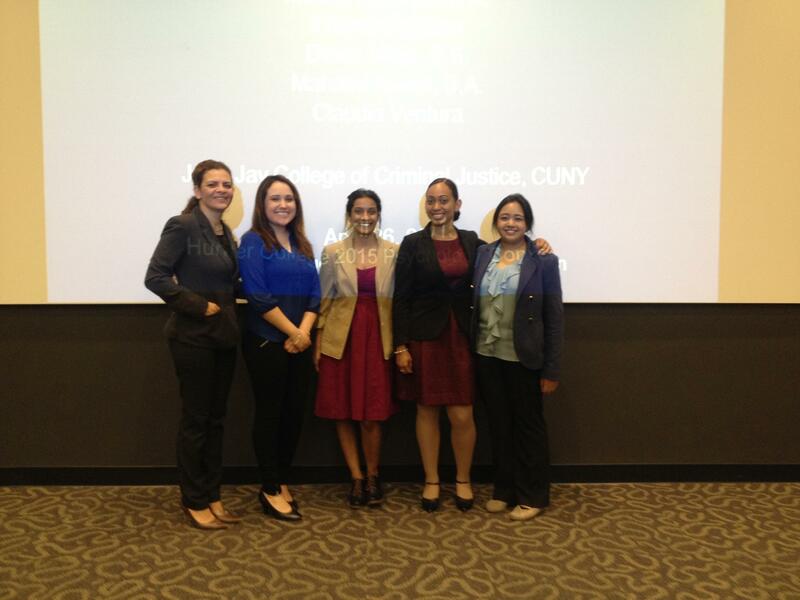 Dr. Mazzula with Diana Mejia, Mahathi Kosuri, Chavel Guzman & Mallika Karunan (Left to Right) at the Hunter College’s 2015 Psychology Convention, New York, NY. Mazzula, S., Serrata, J., Velasco, N., & Vaga, T. (2017, February). What do we know about race and culture in psychology publications? Roadmap toward social justice scholarship. Paper presented at the 32nd Annual Winter Roundtable, Teachers College, Columbia University, New York, NY. Vega, T., Velasco, N. & Mazzula, S.L. (2017, February). 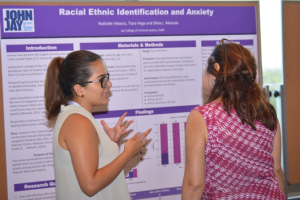 Effects of Racial Identity Status Attitudes on Anxiety of Latinx populations. Poster session presented at the 32nd Annual Winter Roundtable, Teachers College, Columbia University, New York, NY. Velasco, N., Vega, T., & Mazzula, S.L. (2017, February). Racial Identity Status Attitudes and Depression among U.S. born and non-U.S. Latinx individuals. Poster session presented at the 32nd Annual Winter Roundtable, Teachers College, Columbia University, New York, NY. Velasco, N., Vega, T. & Mazzula, S.L. (2016, July). Racial Ethnic Identification and Anxiety. Poster session presented at the 2016 Latina Research Conference, San Antonio, TX. Vargas D., McFadzea, J. & Mazzula, S.L. (2015, November). Group identification and anxiety among Latinos and Non-Latino Whites. 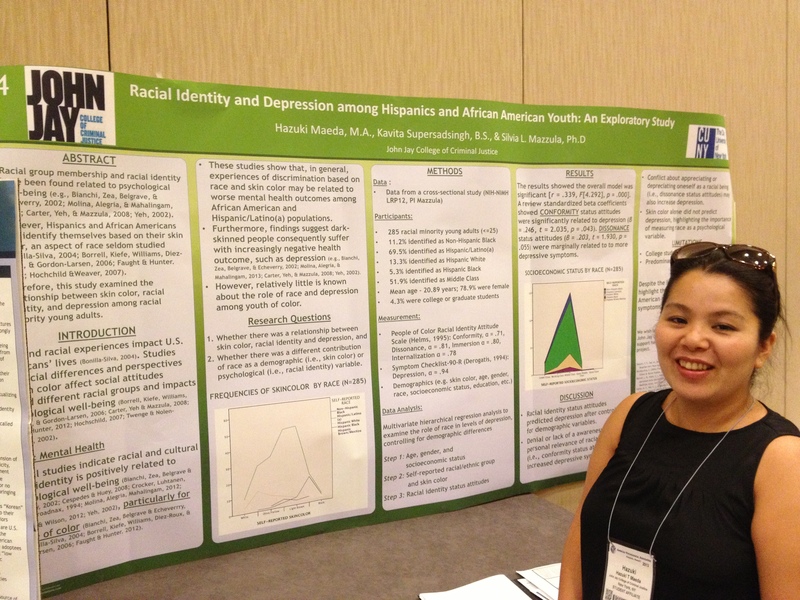 Poster presented at the Latino Psychological Association Annual Conference, Hackesack, NJ. McFadzea, J., Vargas D. & Mazzula, S.L. (2015, November). Socioeconomic status and the impact on the self. Poster presented at the Latino Psychological Association of New Jersey, Hackensack, NJ. Karunan, M,. Kosuri M., Guzman, C., & Mazzula, S. L. (2015, May). The Influence of Immigration on Acculturation, Social Network and Anxiety: A Study of Hispanic Immigrants and Non-Immigrants. Poster session presented at the 27th Association for Psychological Science Annual Convention, New York, NY. Meija, D., & Ventura, D. (2015, April). Does Immigration Status Influence Racial Identity? : A Study of Hispanics’. In S. L. Mazzula (Chair and Discussant). Decoding Interactions between Social Network, Self-Esteem, and Racial Identity Among Ethnic Minorities. 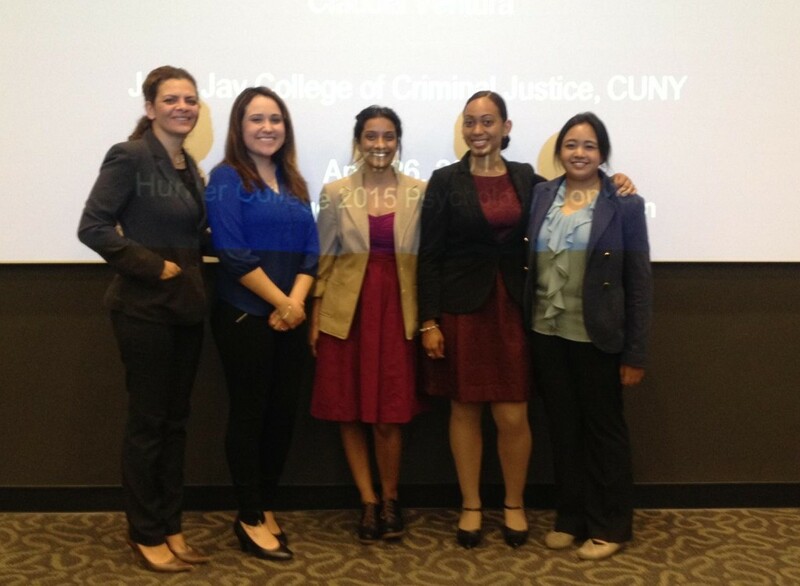 Symposium conducted at the Hunter College 2015 Psychology Convention, New York, NY. Guzman, C., & Kosuri, M. (2015, April). The Effect of Social-Racial Network on Collective Self-Esteem: A Study of Asian-Americans and African-Americans. In S. L. Mazzula (Chair and Discussant). Decoding Interactions between Social Network, Self-Esteem, and Racial Identity Among Ethnic Minorities. Symposium conducted at the Hunter College 2015 Psychology Convention, New York, NY. Karunan, M., & Kosuri, M. (2015, April). The Relationship between Social-Racial Network and Collective Self-Esteem on Ethnic Minorities’ Mental Health . In S. L. Mazzula (Chair and Discussant). Decoding Interactions between Social Network, Self-Esteem, and Racial Identity Among Ethnic Minorities. Symposium conducted at the Hunter College 2015 Psychology Convention, New York, NY. Fazio, C., & Rodriguez, L. (May, 2014). Mental health treatment preferences of english speaking hispanics. Poster presented at the 10th Annual Forensic Psychology MA Student Research Conference, New York, NY. Fazio, C. D. & Mazzula, S.L. (2014, April). Hispanic representation in forensic research studies: How can we better serve the criminal justice involved? Poster presented at the 2014 Latina Research Conference, New York, NY. Rodriquez, L., Fazio, C., & Mazzula, S.L. (2013, November). Mental Health Service Utilization by Hispanic College Students: An Exploratory Study. Poster presented at the Latino Psychological Association of New Jersey Annual Conference, Trenton, NJ. Mazzula, S.L. & Fazio, C. (2013, November). Hispanic representation in forensic studies: Improving Information for Forensic Practitioners and Researchers. Poster presented at the Latino Psychological Association of New Jersey Annual Conference, Trenton, NJ. Alpert, M. & Mazzula, S.L. (2013, August). Role of Counseling Psychology in Latino-Focused Publications. Paper presented in S. Mazzula (Chair), Race and Culture in Psychology Publications: A Call to Action in Research, Theory and Practice. Paper presented at the American Psychological Association 121st Annual Convention, Honolulu, HI. Fazio, C. & Mazzula, S.L. (2013, August). Racial Ethnic Minorities in Forensic and Counseling Psychology Empirical Studies. Paper presented in S. Mazzula (Chair), Race and Culture in Psychology Publications: A Call to Action in Research, Theory and Practice. Paper presented at the American Psychological Association 121st Annual Convention, Honolulu, HI. Supersadsingh, K., Taesilapasathit, C., Maeda, H. & Mazzula, S.L. (2013, August). The Relationship of Racial Identity and Collective Esteem among Young Women of Color. 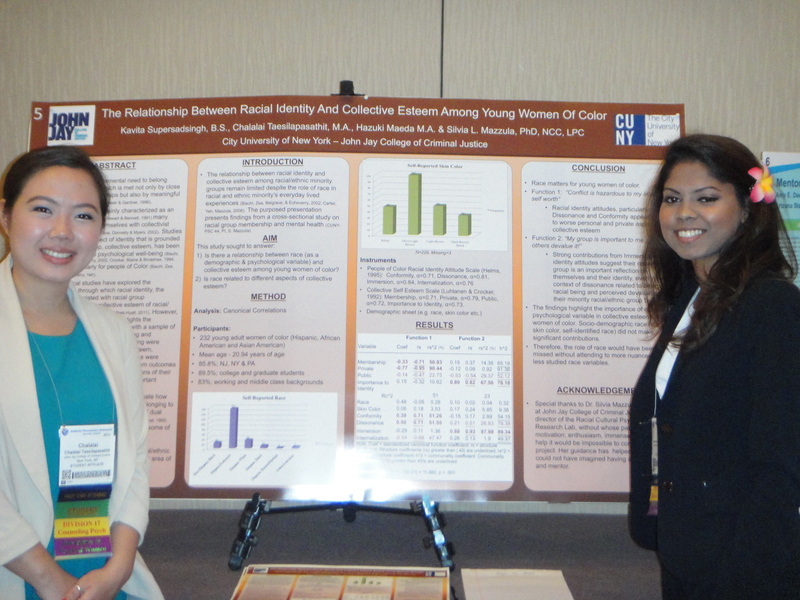 Poster presented at the American Psychological Association 121st Annual Convention, Division 17 Sponsored Student Program, Honolulu, HI. Maeda, H., Supersadsingh, K., & Mazzula, S.L. (2013, August). Skin Color, Racial Identity and Depression among Emerging Adults of Color. Poster presented at the American Psychological Association 121st Annual Convention, Division 17 Sponsored Student Program, Honolulu, HI. Fazio, C. D. (2013, May). Searching for diversity: Inclusion rates of Hispanics, African Americans and Caucasians in forensic psychology empirical publications 1999-2009. Poster presented at the 9th Annual Forensic Psychology MA Student Research Conference, New York, NY. Maeda, H. (2013, May) Racial Identity, Skin Color, and Depression Among Racial Minority Young Adults: An Exploratory Study. Poster presented at the 9th Annual Forensic Psychology MA Student Research Conference, New York, NY. Mazzula, S.L. & Fuji-Doe, W. (2012, June). 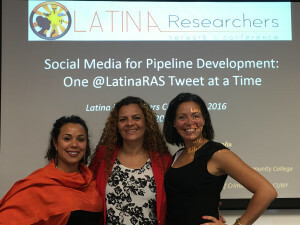 Latinos/as and Forensic Psychology Empirical Studies: Where are we and where do we need to go. Paper presented at the 2012 Biennial John Jay College International Conference, New York, NY. Mazzula, S.L., Fujii-Doe, W., & Grant, M. (2011, December). Latinos/as’ in Forensic Psychology Empirical Studies: Preliminary Findings. 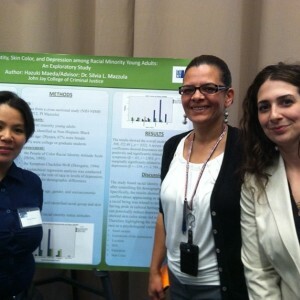 Poster presented at the Latino Psychological Association of New Jersey, 12th Annual Conference. Seton Hall University, West Orange, NJ. Mazzula, S. L., Wilkens, E., & Grant, M. (2010, November). 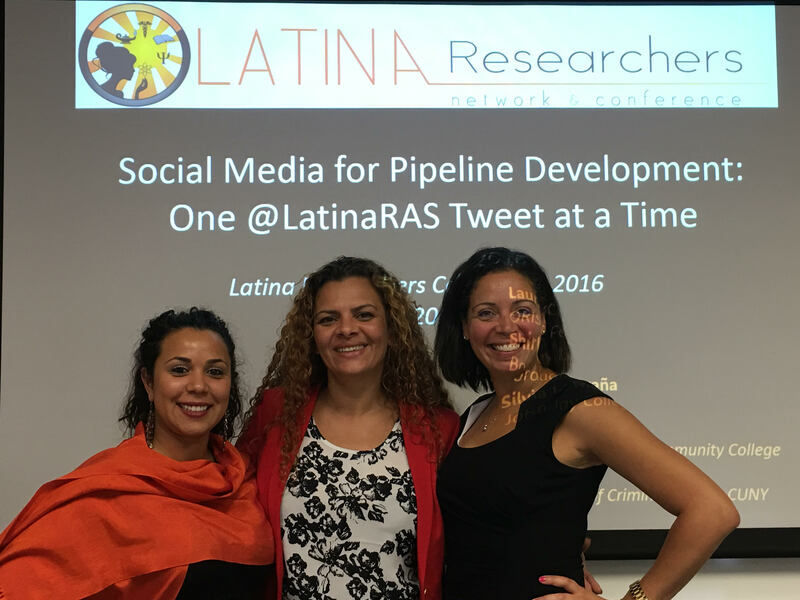 The role of race and skin color in Latinas’ self-concept. Paper presented at the National Latino/a Psychological Association Biennial Conference, San Antonio, TX. Mazzula, S.L., Wilkins, E., Grant, M., & Dudash, L. (2010, October). Latinos/as’ inclusion in counseling and forensic psychology scholarly discussions: Preliminary findings. 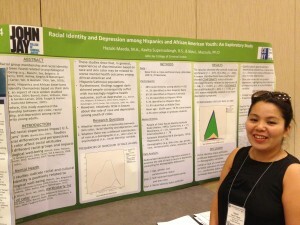 Poster presented at the Latino Psychological Association of New Jersey, 11th Annual Conference. Montclair State University, Montclair, NJ. Mazzula, S. L., Stratton, J., & Dudash, L. (2010, February). Racial identity and collective self-esteem among Latino/a Americans: An exploratory investigation. Paper presented at the 27th Annual Teachers College Winter Roundtable on Cultural Psychology and Education, Teachers College, Columbia University, New York, NY.